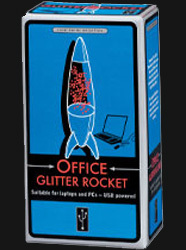 The Loncraine Broxton Office Glitter Rocket is designed to glam up your office workspace as well as provide a little ambient lighting to any boring, dingy office room. If placed in the right environment this USB gadget will make you the talk of the office. The light is just bright enough not to be distracting, and the glitter moves just enough to be mesmerising, but not annoying. There are a few things that any potential buyer might like to think about before parting with their money. For starters the USB cable is not overly long and, while it's designed to stretch, if your PC's hardrive is on the floor you'll have a bit of a struggle placing the rocket anywhere other than the back of your desk. You can stretch it further, but then you'll need to fix it in place (Blu-Tack does the trick) otherwise it will slide back to the rear of your desk again. But then this isn't really so much of a problem as you'll need to place this item near a wall to get the best out of it. 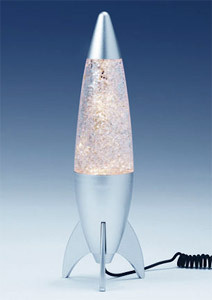 Unless the lamp is placed near a wall, you can't really see the glitter moving very much. There is a little reflection on the desktop, as the light bounces off the glitter, and every now and again your eye will catch the glint of a shaft of light, but on the whole not much seems to be happening. However, place it close to a wall and you'll see lots of movement, as well as small shafts of light occasionally bouncing across your computer. At the end of the day, for the money, this is a fantastic computer peripheral that really does add character to your workspace in a very subtle way.